Came by to check if there was a USB C version yet, thought I'd stop to say that I love this cable to pieces (not literally) and keep buying them for different lab spaces. It's soooo nice not having to dig around for the right cable for the particular gizmo I'm using that day. Thanks for making it! Seconding the request for USB C to be added. I was going to request the same thing. This cable is seriously awesome, but it would be even better if it had a USB C pigtail and perhaps even a female USB port to plug in whatever other weird cable you need. I keep a few of these around the lab for the robotics team that I am a member of. Recently we have kept one plugged into a computer for quick use. Today I happened to brush the hub with the back of my hand and realized that it was warm. Sure enough, I picked it up and it was too hot to hold. I immediately unplugged it and for some reason decided to smell it. It smells like something let the magic smoke out at some point. For $7 it doesn't seem worth talking to customer support about especially since I think we ordered them about 8 months ago. Can you please check if the hub chip is restricting current? I.e. my desktop PC has 2A rated USB ports, and plugged directly into them my devices charge a lot faster, will this hub restrict the current to 500mA or does it just allow whatever the upstream host can provide? This is what I found on mine. I have not tested it to confirm though. Or does it limit current to 100mA? I bought this cable under the impression that I would be receiving a USB cable in the mail. You guys never cease to surprise me, because when I opened the package, i found a gigantic hellish dog looking at me as if I was a slab of steak. Coincidentally, I had just graduated from the National Dog Training Academy and was able to tame the beast (it took a while though). I decided to keep him, because why not, right?! So that's pretty much it. Me and Bernard -- that's his name-- are living happily ever after in my large mansion because I am very rich and i forgot to say i am Bill Gates. Have a nice day. The hub in the Cerberus isn't powered. Now for a three port hub, that may not be a big deal, but it will eventaully byte you. (pun intended). You could have added a socket on the hub to allow for plugging in a standard 5v wall wart power supply you know. OK, in version three maybe. I think I foresee the 5th revision of the Cerberus has having a cooking surface, full Linux OS, LCD monitor, flashlight, emergency flare, serrated knife, wifi access port, and bottle opener. But is it a Turing Machine? By the time it's running Linux? Well, strictly speaking, no, unless we build in an infinitely long tape, but presumably it's Turing complete. Yes, it should have come with the option for external powering considering it's pushed more towards the charging / powering multiple things. While the original cable was great, I'm glad you modified it, if only to stop the flamewars. Someone should make a USB 3.0 version of this. I use a Dremel to grind down the lock tabs on the micro connector. This will prevent ripping the USB terminal and traces from boards like the Fio and Lilypads. Need to be very gentle with micro. I never thought i would get excited about getting a package with a usb-cable in it...yet i did with extreme glee when it arrived! This Cable is just perfect for my needs. 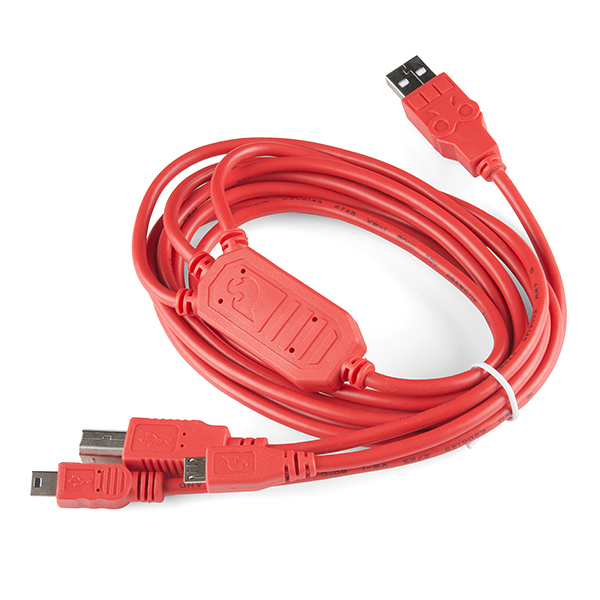 All 3 commonly used plugs in one long red cable. now i don't have to carry multiple cables or try to find the correct on in the tangled black mess of cables i have sitting on my shelf. plus with the integrated hub i can now run my Arduino Leonardo, XMega breakout and Bus pirate at the same time. Considering how i often have to take my projects with me to college and have to program from my laptop this is a ideal solution. I bought one of these from Little Bird Electronics, one of your distributors in Australia, and am disappointed. I thought it would be the answer to all the cables I need to plug to phone, to Arduino and to other devices but with my PC and Win 7 all the cable seems to be able to do is supply power to the connected device but no comms. My Samsung Galaxy 2 will only charge from it, my Sony PCM recorder is not recognised, my Verbatim portable hard drive is not recognised but spins, my WD portable hard drive is not recognised. Looks like I bought a piece of wire encased in red plastic! So it's a low-five to CTP from me. Make sure you have the correct one. The original cable was designed to only use one device at a time and didn't work well with some devices. It worked great with Arduinos and such, but not as well with some commercial products, especially high sped devices such as hard drives and Ardroid devices. Originally we figured that would be fine, but realized people were wanting to use it a bit differently. This version has a USB hub in it to make it more versatile and remove those limitations. But both cables have the same name, and our distributors ended up with both. Make sure you have the version you think you have. Instead of having to cut one of these open, you guys mind saying what USB hub chip is in it? I was sent a defective oneâbad data on mini-Bâwhich SparkFun promptly replaced. The tech said not to bother returning it, so I cut it open, of course! Not much inside; a Terminus FE1.1s USB 2.0 Hub, a 12MHz crystal, and 10 passives on a small PCB potted in hard plastic. Awesome, i always thought my cerb cable was broke, good to know it just wasn't designed for what i was doing. Wil have to make sute this is my next order... Thanks guys for the upgrade/update. I always felt like it was a bit reckless to wire up a USB A male to three B connectors (I mean, I get why you'd do it and how it's useful, but there's always the chance someone will do something dumb like hook up two things at once with it) - so it's nice to see a version that does it "properly", with a hub... But I do expect this one would be a bit problematic for charging, however: since it's a bus-powered hub, the host will shut down any devices which tell the host they need the full 500mA. It'd be fine for devices that just tap power and don't pay attention to the data lines, but anything that does it "properly" and draws only the power the host allows it is probably not gonna charge. Can't win 'em all I guess. How much current can this supply to each device and total? And if I plug it into a USB 3.0 host, will it provide more juice? a USB 3.0 host port should still provide more power to a USB 2.0 device, so yes it should work... unless they have restricted the current in the hub chip. 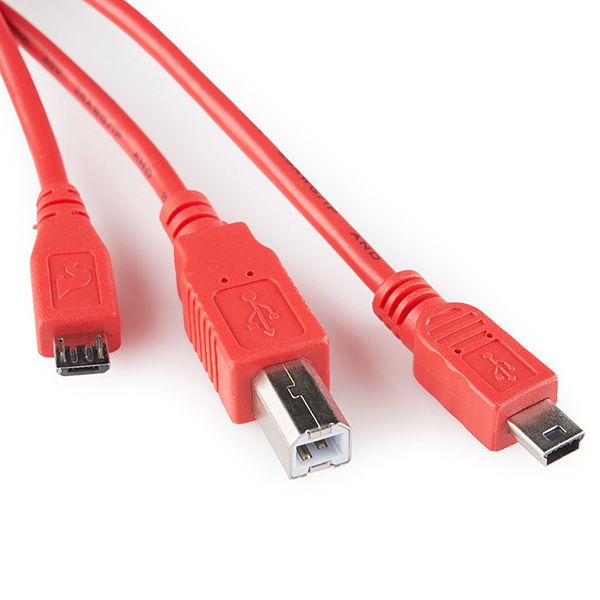 Edit: To clarify this a bit, the extra pins in USB 3.0 connectors are pretty much all for data, the power pins are all common. Well, we're talking about two different problems here: there's the negotiation between the USB host and device of how much power the device is allowed to take, and then, separately, there's how much power the port will actually supply before you blow a fuse or something. In terms of actual supply, probably drawing 500mA from this thing won't be an issue, even if you're hooking it up to a USB 2.0 port. In terms of negotiation, a USB host would only allow a device attached to a bus-powered hub to claim 500mA if the hub was already itself granted -more- than 500mA. Under USB 2.0, that's just not possible. 500mA is the most any USB device is allowed to draw from the bus, so the total of all devices powered by a bus-powered hub has to be less than 500mA, or the host will shut down one or more of the devices. If this were a USB 3.0 hub, then yes, it could negotiate for more than 500mA from the host and downstream devices could themselves negotiate for 500mA or more. But as far as I know, this is just a run-of-the-mill USB 2.0 hub, so it can't do that. There's a lot of devices made that plug in to USB and draw more current than they actually report to the host (Arduinos, IIRC, request only 100mA - but depending on what kind of hardware you've got powered by the Arduino it could require more power than that) - and some devices just tap the USB power pins and don't communicate with the host at all. Technically, you're not supposed to do this. Power is negotiated with the host in order to protect the host from excess current draw and protect the devices from a brown-out. As a result, some devices (PS3 controllers, for instance) won't charge from USB unless they are enumerated by a USB host which grants them 500mA current draw - and so as a result you can't charge a PS3 controller by connecting it to a bus-powered hub. Under USB 2.0, thatâs just not possible. 500mA is the most any USB device is allowed to draw from the bus, >so the total of all devices powered by a bus-powered hub has to be less than 500mA, or the host will shut >down one or more of the devices. That is providing the hub follows the spec to the letter, which a lot of them don't. I've bought this cable to power my bus pirate on the usb mini-b, but use it with my arduino uno on the usb b, and cellphone as a micro-b. This cable is awesome! I love using it to power an Arduino type board over Micro-B (such as the Sparkfun ESP8266 Thing) while using the Sparkfun FTDI Basic Breakout over Mini-B to program it and monitor Serial communication. It's also great for powering multiple devices simultaneously, though note you're limited by the supplying USB port. This is an awesome cable. Considering that this cable costs only a little bit more than a single cable of one type, I figured it was worth a try. The only issue I've had is it will not charge my phone faster than my phone drains power, but as that isn't the intended function of this cable it doesn't affect my review. It works well for my Arduino and AVR ISP programmer. This cable is great for toying with multiple Arduinos at once. Well worth $7. Works great.. even better when I remembered it was a USB hub! I originally bought this so that I only needed one cable to switch between Micro-B and Mini-B; having the type B was just a bonus. $7 (at the time of writing) is a small price for three cables in one. Worked great when I got it: high-quality connectors, high-quality cable, great length, and a color I'll be hard-pressed to not spot in a bin of dongles and wires. I originally forgot this thing is actually a USB hub and only remembered after looking at the USB device tree on my machine. It's pretty slick to be able to plug in a JTAG host board AND my device under debug with the same USB cable. 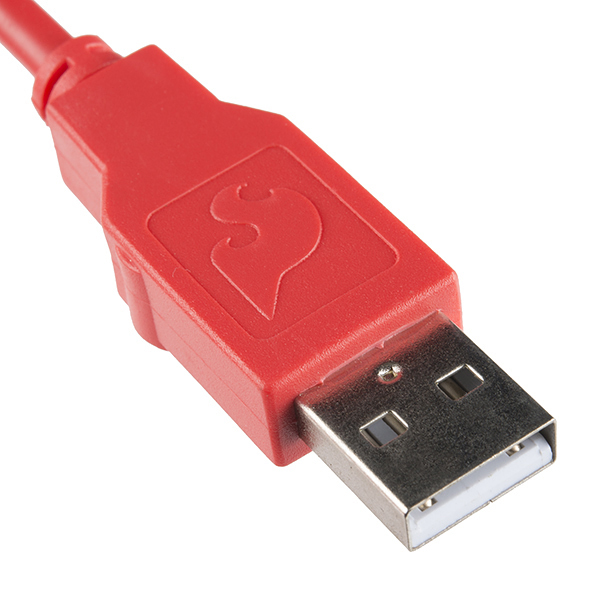 I know this is SparkFun-branded, and thus bears the SparkFun signature red, but I'd love to be able to have this thing in green or purple or blue. I used this in the company truck to power personal and company electronics! For when you have more than one thang, each thang is different, and only one USB port. My desk is awash by an invasion of orange snakes! This cable is SO useful! The quality is great, and it's very useful to have around. I can simultaneously program an Arduino Uno, a Nano, and an ESP8266 dev board, all from one USB port!